There is no single cause or cure when it comes to migraine headaches, and the role almonds may play in a migraine also vary from person to person. For some people, almonds may be a trigger that sets the headache process in motion. For others, almonds may help to ease headache pain. Migraines are a severe type of headache that can last for hours or days and may force a sufferer to seek relief by lying down in a dark, quiet area. Migraines can cause intense throbbing or pulsing, often on one side of the head, and frequently are accompanied by nausea, vomiting and extreme light and sound sensitivity. Some people with migraines may see bright spots or flashes or light, experience vision loss, feel pins and needles in their arms or legs or suffer speech and language problems. There are many ways of treating migraines, and those who get the headaches may be asked to keep a headache log to help in their treatment. There are many different things that can trigger a migraine in people prone to the headaches. Some of the common triggers include hormonal changes, stress, eyestrain, changes in sleep patterns, extreme heat or cold, odors, bright lights, skipping meals and certain foods and beverages. Alcohol, caffeine, cheese and chocolate are common migraine triggers, but some people cite almonds as a trigger too. Doctors often ask migraine patients to note whether certain foods, such as almonds, appear to be linked to their migraine problems. Patients may then be asked to eliminate certain foods from their diets to assess the effect they have on their migraine headaches. Some people who suffer from migraines have been found to have lower than normal levels of magnesium, so magnesium supplements have been used as a possible treatment for the headaches. Results have been mixed. Migraine sufferers who would like to try increasing their magnesium intake can turn to almonds for help. The recommended daily allowance of magnesium for adults ranges from about 300 to 400 mg/day, based on age and gender. A 1 oz. 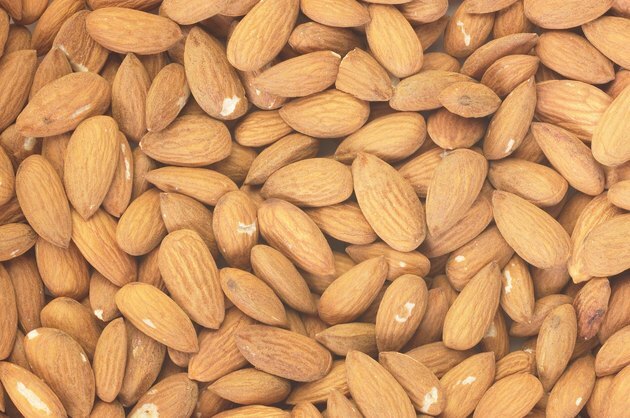 serving of almonds has 78 mg of magnesium, according to the Linus Pauling Institute. Migraines can be extremely painful and can have a severe impact on your life, so speak with a doctor before trying to self-treat with foods and supplements. Doctors have a wide range of medicines and other treatment options for migraines. To help your physician, take notes before your visit on the frequency and severity of your headaches, as well as any possible triggers. Can Magnesium Give You a Headache?